It’s darn near 2019, people. If you are still communicating via phone or lengthy snoozefest emails, you need to get with the times. In today’s day and age, people are getting messages across with video. Why? Because video drastically reduces confusion and time spent clarifying. Now, meet your new favorite video tool: Dubb. Dubb is a video communication platform that lets you build relationships and quickly convey information to prospective and existing customers. Dubb helps you create and share conversion-driving screen recordings and live and prerecorded videos without any specialized equipment, software, or technical skills. These videos can be used to increase sales, improve marketing, and simplify onboarding. Every video in your account will be hosted on a subdomain, which can be customized with your own logo, custom URL, page theme, contact information, additional video playlists, and more. Dubb makes creating and sharing videos on desktop and mobile as easy as stealing candy from a baby (please don’t do this). You can also export your videos as an MP4 file to place on any other platform you choose including Facebook, Vimeo, Instagram, LinkedIn and more. 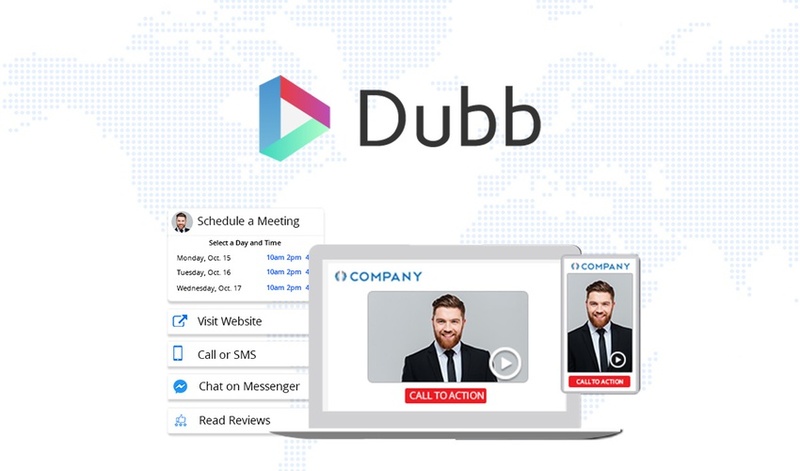 With Dubb, you can add screen, webcam, phone or MP4 videos directly into Gmail, LinkedIn, Instagram, WordPress, MailChimp, Constant Contact, and dozens of CRM systems. Uploading your videos to Dubb is only half the fun. Once you’ve uploaded a video, you’ll be able to add a title, description, and tags; toss in CTA’s; choose player colors and themes; and select start time, end time, and thumbnail graphic. I know your eyes widened when I mentioned CTAs. That's right, folks. Dubb gives you the ability to throw in five different kinds of CTAs: email, URL, phone, FB Messenger, and calendar. Other screen-sharing tools can only dream of letting you add CTAs to FB Messenger! And marketers, you also have the ability to track the conversions of emails, calls, and CTAs. But not just track, we’re talking detailed tracking in real-time on video activity so you always know when to follow up and make the most of your communication. Hallelujah! Folks all over are using this first and only sales-focused video communication platform to share videos and increase conversions. All of this video greatness can be yours for life for just $59! Uh huh. We are giving you a conversion thoroughbred for only $59. And Sumo-ling, you can stack an unlimited amount of codes. Each code will give you an additional team member, 100 videos, 10GB of storage, 10k contacts! Start impressing customers with video now! Did you know: The Dubb team has developed a proprietary set of features that are specifically designed to achieve the highest levels of engagement, conversions, and sales. This custom set gives Dubb a leg up on the free and paid alternatives. You’ll also have a neat Exit Intent modal to stop people from leaving and further maximize your conversations! We all know how it feels to spend hours crafting the perfect email campaign only to see 2% of people click through. But, Dubb is here to turn that frown upside down. Start creating videos that engage and convert.